A green flag with a white inscription above a crescent moon with horns upwards, all within a circle of chain and all around a white wreath with a ribbon at the base. Proportion 2:3 reported in Pavillons nationaux et marques distinctives, but noted that the flag is also known in ratio 1:2. According to the close-up view of the emblem in Pavillons nationaux et marques distinctives, the chain includes 19 elements. Confederation of Arab States, formed in Cairo on 22 March 1945, for the purpose of securing Arab unity. Members: Algeria, Bahrain, Comoros, Djibouti, Egypt, Eritrea (pending), Iraq, Jordan, Kuwait, Lebanon, Libya, Mauritania, Morocco, Oman, Palestine, Qatar, Saudi Arabia, Somalia, Sudan, Syria, Tunisia, United Arab Emirates, Yemen. I believe that 'Arab League' is the short name of the 'League of Arab States', the same way the 'United Nations' is the short name of the 'United Nations Organization'. The Arab League website is headed "Jami'at [the apostrophe representing the letter ayn] ad-Duwal al-Arabiyyah" (League of Arab States). There are two homepages, one in English and the other in Arabic. The words "Arab League" in the links on the English page are rendered as "aj-Jami'a al-Arabiyyiah" on the Arabic page. So Ivan is correct about this. 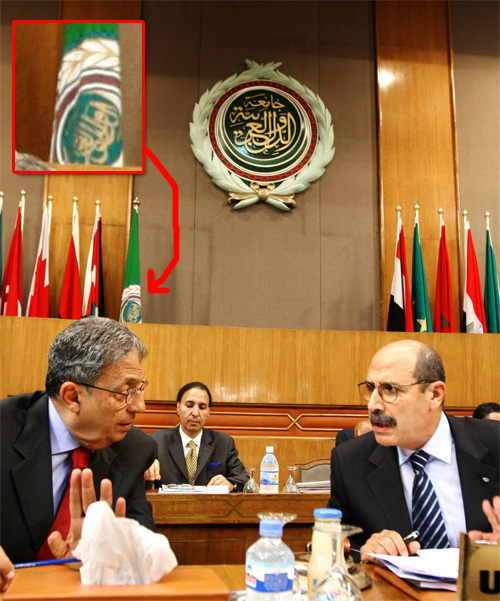 Arab League - green flag with the emblem of the League - in white wreath a chain makes a circle in it a crescent pointing up an a text in Arab letters. The second image shown here is an adaptation of the image published by Ed Haynes on his Flags of Arab World . I have seen the chain made both red and yellow, and the text also white or black. To answer the query about the importance of the number of chain elements, they in fact represent the 20 Arab countries (at the time of adopting the flag) before two new member states (Comoros & Djibouti I think) joined to make 22 Arab countries. 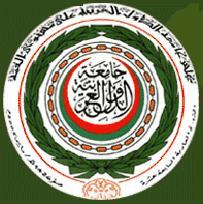 The text on the flag gives the name of the organization: Jama'at ud-Dawlaat il-Arabiyya, or League of Arab States. It seems that there is another variant of Arab League flag. The circular chain seems to be in red colour with black background, wreath is white on gold background, inscription is gold instead of white, and there is also minor blue ring outlining whole emblem, as shown at http://www.flagid.org/vexphotos/arableague.jpg. I observed a white flag with a logo during news coverage of the recent Arab League summit. A bit of googling reveals it to be the summit logo, and the flag to be the Presidential Flag of the summit, at least according to http://en.wikipedia.org/wiki/Flag_of_the_League_of_Arab_States, which shows two additional ones, from the 2002 and 2004 summits. The 2007 summit's logo is best (poorly) shown here: http://www.arabsummits.org/. The site header at the League's official site shows a green flag with a logo; zooming in on an English inscription in the lower part of the logo reveals it to be the League's 60th anniversary flag.